An intrepid meditating monk surfs amongst the remains of a once famous town. He glides over the relics of a flooded RMB City, facing obstacles of all sorts. In a post-disaster landscape, seemingly made from colour handwritings, this surfing journey is a thoroughly planned, fully conscious full-length drama with all the dramatic conflict pre-planned and built in, or an interactive movie where each player picks her own paths. If what we are gliding over is not a wave but the remnants of this city, a building, or an event, or even if what we are gliding over is civilization itself, or ideology, then this surfing journey really is a slightly different, game version of RMB City itself. The monk-avatar, his heart at ease, his board light, constantly overcomes the obstacles but never reaches anything resembling a final destination. 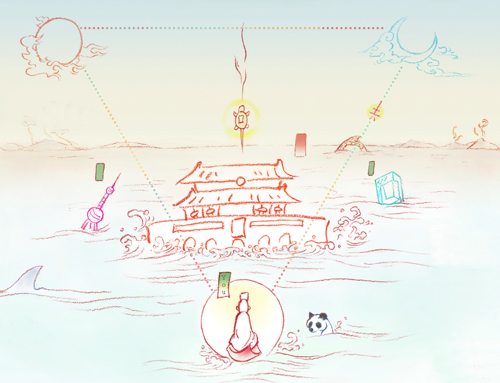 Similar to certain phenomena in life, throughout constant elevation of the soul through transmigration, RMB City Surfing Game guides the player through a journey of self-cultivation.